Jacques Kallis (born 16 October 1975) is a former South African cricketer and former Test and ODI captain. As a right-handed batsman and right-arm fast-medium swing bowler, Kallis is regarded as one of the greatest cricketers of all time and one of game's greatest all-rounders. As of 2016 he was the only cricketer in the history of the game to score more than 10,000 runs and take over 250 wickets in both ODI and Test match cricket, pouching 131 ODI catches along the way as well. His Test match career in particular saw him score 13,289 runs, take 292 wickets and 200 catches respectively. Kallis became the fourth player and first South African to score 13,000 Test runs on an eventful opening day of the first Test against New Zealand on 2 January 2013. Kallis, who had also taken 292 Test wickets, lies third behind Indian player Sachin Tendulkar (15,921) and Australian Ricky Ponting (13,378) on the list of all-time run scorers in test cricket. He was named one of the Wisden cricketers of the year in 2013. He retired from Test and first-class cricket after playing in the second Test against India at Durban in December 2013; Kallis scored his 45th Test hundred in this match, making him one of the few batsmen to score a century in his final Test. He retired from all forms of international cricket on 30 July 2014. Kallis also featured for Wales, representing the nation against England in the 2002 Natwest Challenge, helping them to an 8 wicket victory with a return of 31–1 off 10 overs and a score of 3 in the run chase. He is the current coach of Kolkata Knight Riders. Kallis attended and played cricket for Wynberg Boys' High School. In 2009 Wynberg honoured Kallis by naming their main cricket oval after him. As a teenager, Kallis had a brief spell with Netherfield CC in England where he established himself in Northern England – Kallis was only 19 when he spent a summer at Parkside Road back in 1995, returning 791 runs at an average of 98.87 from 14 matches before making his Test debut against England later that year. Kallis also played for Old Edwardians for a spell as a teenager, where coaching staff saw potential for him to become a first-class all rounder; in July 1993 he was picked for South Africa U-17's against Scotland's U-19 team. He made his first-class debut in 1993/94 as an 18-year-old, playing for Western Province B. His first Test appearance was on 14–18 December 1995 against England in Durban, but he struggled with the bat in his first few matches. Kallis made his World Cup bow in 1996 in Pakistan but did not have much opportunity to excel. His breakthrough came in 1997 with 61 against Pakistan, but more notably two matches later when he salvaged a draw for South Africa with a fighting century against Australia at the Melbourne Cricket Ground. Between 1998 and 2002, Jacques Kallis was one of the world's leading all-rounders, as seen in the ICC's cricket ratings. In 1998, he led South Africa to the ICC Champions Trophy title with two "Man of the Match" and the "Player of the Series" performances. The youngster was solid, without being spectacular, in the 1999 ICC Cricket World Cup, before a "Player of the Series" performance led South Africa to a stunning Test series victory against India in India in 2000. By late 2001 he was the world's number one ranked Test all-rounder, having held the same ranking in ODIs for the best part of 3 years. During this time, "Kallis blossomed into arguably the world's leading batsman, with a defensive technique second to none, and the adhesive qualities of a Cape Point limpet. Generally a placid and undemonstrative man, he nailed down the crucial No. 3 position in the South African batting order after a number of players had been tried and discarded, and his stock rose exponentially from that moment. [Inappropriate slang]"
Kallis is one of only four players in Test history (after Sir Donald Bradman and before Mohammad Yousuf and Gautam Gambhir) to make a century in five consecutive matches, achieved in season 2003/04. In 2005, he set the record for the fastest half-century, as measured by balls faced, in Test cricket history, scoring 50 against Zimbabwe off only 24 balls. In 2007, Kallis scored five centuries in four Tests, making him just the fourth man after Bradman, Ken Barrington and Matthew Hayden to score four centuries in four Tests on two different occasions. That Kallis holds these records belies his reputation as a defensive batsman of the old-fashioned type, something he himself became increasingly determined to erase in the latter half of his career. Regardless of style, Kallis has a remarkable batting average in the mid-50s, and has been consistently rated as one of the best batsmen in the world. Although still a very capable bowler with 292 Test wickets, he impressed mostly with the bat between 2005 and 2007. As a result, he evolved into more of a batting all-rounder, a role in which he continued because of the emergence of Dale Steyn, Morné Morkel, and Vernon Philander. Kallis is the only man to score over 10,000 runs and to take over 200 wickets in Test cricket. Sir Garfield Sobers managed over 8,000 runs and 200 wickets by comparison, at very similar averages. In 2005 Kallis was selected for the World XI team to play an Asian XI in a benefit match for those affected by the tsunami of 2004, along with countryman Shaun Pollock. In the same year he was awarded the Sir Garfield Sobers Trophy for the ICC player of the year. The award was shared with Andrew Flintoff of England, his only serious competitor as the world's leading all-rounder, after the votes of the academy were tied. Kallis also won the "ICC Test Player of the Year" award that year. Kallis was awarded the captaincy of South Africa for the third and final Test match against Australia in 2006 when Graeme Smith stood down with an injury. 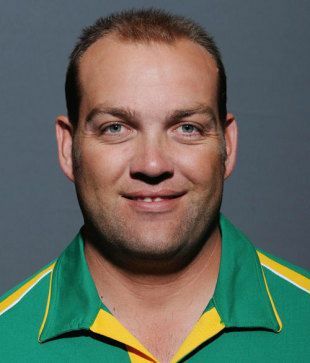 Kallis currently holds a number of South African cricket records, including most ODI and Test runs, highest ODI and second highest Test batting average and most Test centuries by a South African. In the 2007 World Cup Kallis was South Africa's leading run-scorer with 485 runs at 80.83. He was, however, criticised in the press for some slow performances which cost South Africa momentum at key stages in the tournament. In August 2007, he was omitted from the 15-man South Africa squad for 2007 ICC World Twenty20, and consequently quit as the Proteas' vice captain. He was restored to the team for the Test series against Pakistan, where he smashed three centuries in four innings and was awarded "Man of the Match" twice and "Player of the Series" to underscore his importance to the South African cause. 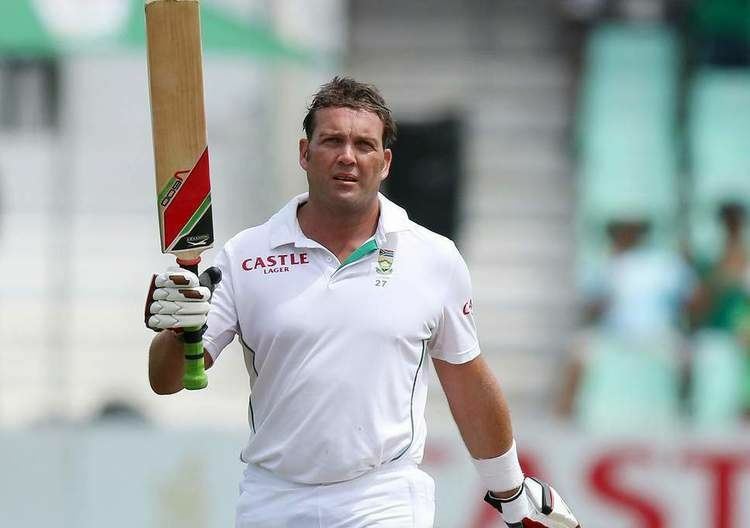 Following his successful tour of Pakistan, Kallis smashed two aggressive centuries in matches against New Zealand at Johannesburg's Wanderer's Stadium and Centurion Park in Pretoria, thus taking his total century count to five in four matches. Following this purple patch of form, Kallis endured three tours without success in the form of hundreds, although the Proteas secured historic series victories in England and Australia, and won a two-match series against Bangladesh at home in between. Kallis returned to form after an indifferent 2008 and averaged over 50 in his next six series. During this time, the Proteas won one series (against West Indies), drew four (two against India, one against England, and one against Pakistan in the United Arab Emirates), and lost one series to a resilient Australia. Kallis scored a masterful 173 in Nagpur in 2010 before the Centurion Test against India later in the year when he scored his maiden double-century in Test match cricket. His 201 not out came in a landslide victory for South Africa as two of the team's future batting stars contributed significant hundreds of their own (AB de Villiers and future captain Hashim Amla). For the second time in his career, Kallis scored twin centuries in a match, during the third test of the series at his home-ground, Newlands in Cape Town. 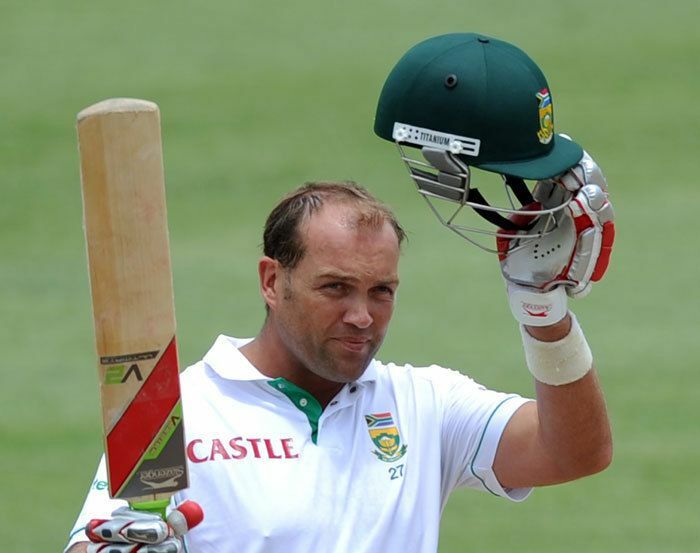 In January 2012 Kallis scored his highest score in Tests – 224 against Sri Lanka at Newlands. The last eight series that Kallis played in for South Africa were all victories for the Proteas, with the exception of one series draw against Pakistan in the UAE. Kallis became one of the few players in world cricket to have one two series each in England and Australia (his 182 not out at The Oval, and his 147 at The Gabba in Brisbane contributed richly to his team's successes). The Proteas also won two series against New Zealand and one against each of India, Pakistan, Sri Lanka, England and Australia. Throughout this period of his career, Kallis still managed to chip in with valuable economical overs and he had a penchant for taking important wickets with a golden arm. In September 2014 Kallis signed a one-year contract for the Sydney Thunders in the BBL. His first appearance for the thunders he scored an important innings of 97* and picked up a wicket. In 2008 more responsibility was placed on Kallis as an all-rounder due to the retirement of Shaun Pollock. Despite the pressure an all-rounder began to emerge in Wayne Parnell who did some good lower-order batting. Kallis endured an uncharacteristically poor 2008 with the bat, averaging well under thirty for much of it. Against the ninth-ranked Bangladesh, he averaged just 25.75 in four Test outings. He also played for Royal Challengers Bangalore in the Indian Premier League, where he averaged 16.85 runs per innings with the bat and 55.5 runs per wicket with the ball at an economy rate of 9.65 in the 7 matches he played before he was dropped. South Africa toured Australia for a three-match Test series and five-match ODI series starting in December 2008. The tourists had a successful 9–2 Test win-loss ratio in 2008; however, Australia had just come off a 2–0 away series defeat against India, and had a 5–3 ratio for the calendar year. Prior to the series, Kallis had a batting average of 38.32 in 18 Tests against the number one ranked team, substantially lower than his overall average of 55.06. In spite of an average of 124.50 in 12 Tests against lowly ranked Zimbabwe and Bangladesh, former Australia fast-bowler Rodney Hogg labelled the all-rounder "a flat-track bully, who dishes it out to the minnows like Bangladesh and Zimbabwe but goes missing against the Australians." In the first Test starting on 17 December, Kallis scored 63 in South Africa's first innings, before he was dismissed by Mitchell Johnson, in the midst of a bowling spell consisting of 5/2 in 20 balls. After failing to make a breakthrough in Australia's first innings, Kallis took 3/24 in their second, while completing four catches in the match. He then scored 57, while being involved in a 124-run partnership with AB de Villiers, as South Africa chased down 414, the second-highest fourth-innings run-chase in Test history. In the second Test in Melbourne starting on Boxing Day, Kallis struggled to be potent in Australia's first innings, taking 1/55. While making a start in his team's first dig, he managed only 26, before taking 2/57 when the home-side batted again. Chasing just 183, Kallis was not required to bat, as South Africa completed their first Test series victory in Australia. In Australia's 103 run Third Test victory in Sydney, Kallis struggled, taking 1/54 and 0/13 with the ball, while scoring 37 and four with the bat. The win was South Africa's 11th in a year in which they drew with India in India, defeated England in England, Australia in Australia and also recorded series wins over West Indies and Bangladesh. Kallis featured in all of those matches and remains an integral part of the champion side's set-up. On 10 April 2013 he was named one of the Wisden cricketers of the year for 2013. Kallis then participated on the tour of the West Indies in which he scored his 35th test cricket century. Kallis injured his neck during the 2010 Champions League Twenty20 playing for the Royal Challengers Bangalore and he missed the Twenty20 and ODI series against Zimbabwe. But he returned for the ODI series against Pakistan in which he scored 66 before having to retire hurt with cramps. He did however manage to lay the foundations for an eight-wicket victory. 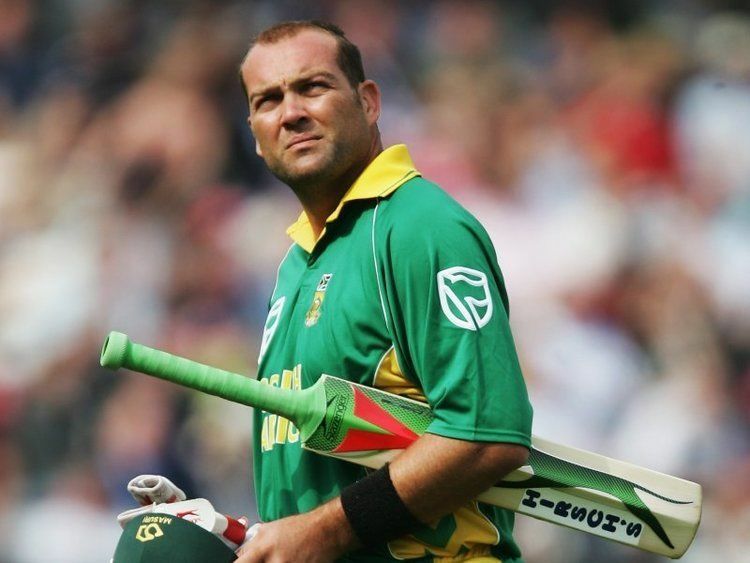 In the same ODI Jacques Kallis scored his 129th ODI six, the most by a South African in the format, overtaking the record from Herschelle Gibbs. Kallis however picked up an injury and was a doubtful starter for the second ODI. In December 2010, On the 3rd day of the first test against India Kallis scored his maiden double century finishing on 201* (not out). 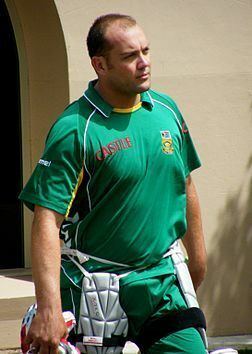 Kallis was selected by South Africa for the 2011 ICC Cricket World Cup as their main batting all-rounder. In the 2011–12 season, Kallis scored his second double century in Test cricket, reaching 224 in South Africa's first innings of the third Test of the home series against Sri Lanka. The Test was Kallis' 150th; he became the sixth player in history and the first South African to reach this milestone. After the series former Indian captain Sourav Ganguly said that he considered Kallis to be the "most effective player" in Test cricket. Brett Lee, the Australian pacer named Kallis as the best player in the world in an interview after their victory for Kolkata Knight Riders for his performance in IPL 2012 final against Chennai Super Kings. He played a crucial role in the qualification of the Royal Challengers Bangalore to the Champions League T20 during IPL-3 and later on played a crucial role in the triumph of Kolkata Knight Riders in IPL-5 by scoring a total of 407 runs and taking 15 wickets. 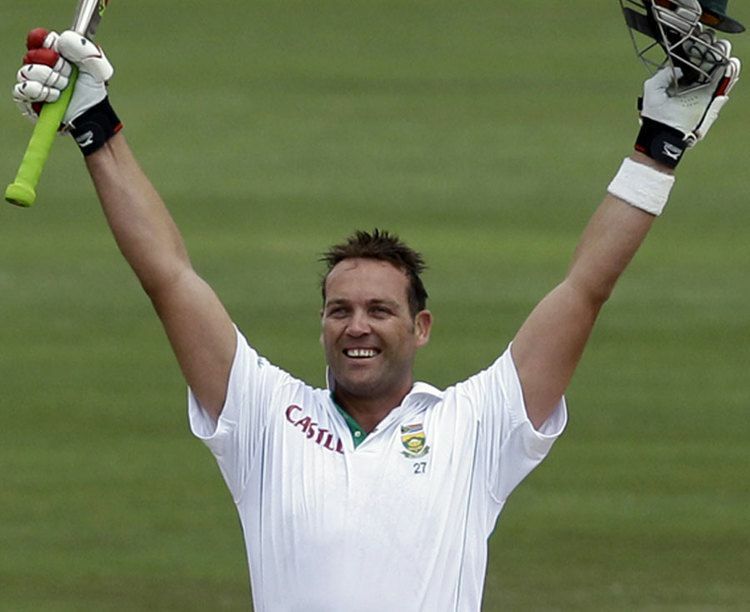 Jacques Kallis has 97 sixes to his name in test cricket, second only to Adam Gilchrist (107). Kallis is only the second fielder (apart from wicket-keeper) in test cricket to take 200 catches, behind to only Rahul Dravid (210). Kallis was appointed head coach of Kolkata Knight Riders in October 2015 when head coach Trevor Bayliss resigned to take over as head coach of England cricket team in June 2015. Kallis was also batting consultant of KKR for 2015 Indian Premier League season. Whether on the front or back foot, he plays well on the on- and off-side. He’s not Brian Lara or Ricky Ponting in terms of aggression or flair but he is rock solid and, added to that, has every shot in the book. Also his cover drive and flick off the hip are right up there in terms of execution and attractiveness. ... He can score quickly at times but it is his way of being able to read situations that sets him apart. ... He knows when to grind it out or move up through the gears. Some people think he could move through the gears quicker when batting, and that is probably a fair argument on occasions, but the majority of the time he knows what he can do at the crease and believes South Africa have a better chance of winning if he stays there. Sobers [was] all prowling grace and feline elasticity, with his 360-degree batswing and three-in-one bowling; [whereas] Kallis [is] all looming bulk and latent power, constructed like a work of neo-brutalist architecture. ... Yet what they are just as much opposites of are their respective eras. Sobers was the most explosive cricketer of a more staid age, the more mercurial because of the orthodoxy and rigidity around him; Kallis is the most stoic and remorseless cricketer of an era more ostentatious and histrionic. ... Sobers was a cavalier among roundheads; Kallis has steadily become a roundhead among cavaliers. We heard something was wrong with my dad during the  World Cup. He started feeling unwell and then, out of the blue, we were told he only had a few months to live. It was a huge shock because we've always been a very close family. I missed the first couple of Tests in England that year so I could be at home with him. It was obviously the saddest time of my life but those last weeks were maybe some of the most beautiful. It gave me a chance to say thank you and goodbye. After a while I realised how lucky I was to do that. It's far harder if a parent is taken away before you have that time together. So his death put cricket in perspective for me. It's just a game – and a very simple game if you keep your mind straight. Kallis dated former Miss South Africa 2002 Cindy Nell, and was even engaged to her but he broke the relationship after nine months. After that he dated Miss South Africa 2003 1st runner-up Marisa Eggli for a brief period in 2004. Since 2007, Kallis dated Shamone Jardim, a South African model for 6 years. They ended their relationship in June 2013, but were reported to be back together in December 2013. The Jacques Kallis Scholarship Foundation was established in Kallis' benefit year with the aim of combining the academic and life skills programmes of existing school structures with funding and mentoring support from Jacques Kallis. The Foundation with its partners, hopes to provide talented youngsters the opportunity to reach their full sporting and academic potential. Currently, the Foundation sponsors 2 boys from Wynberg Boys', 2 boys from Pretoria Boys High School, 2 from Maritzburg College and 2 from Selborne College. Jacques Kallis participates in annual fundraising events for his Foundation, to which he invites fellow South African celebrities and cricketers like Mark Boucher and André Nel. He was also the first bowler to take a fifer in ICC Champions Trophy history. Kallis was also the first player to bag the Player of the final as well as the Player of the Tournament awards in ICC Champions Trophy.